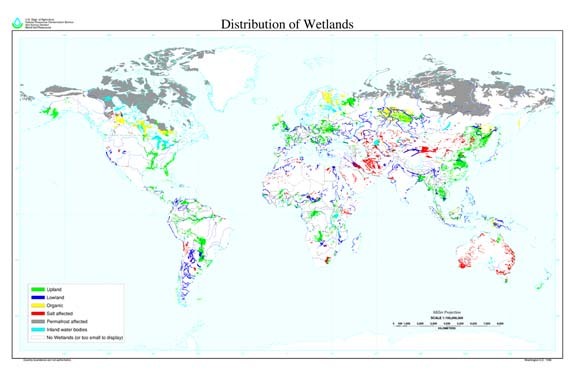 What are wetlands? Wetlands offer ecosystem benefits and it is said they are considered the kidneys of the earth because they filter and store water so efficiently in addition to providing habitats to plants and wildlife. 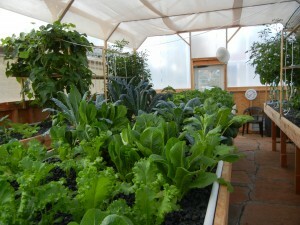 Aquaponics systems are wetlands at their finest, providing fish and a place for growing crops that humans can consume in a system that duplicates nature; providing ‘wetland’ vegetation, requiring very little energy other than sunlight, can be built almost anywhere, pay for themselves in a few years and can be operated by semi-skilled labor. Win/win/win/win, ad infinitum. The flow of nutrients and water will support some of the fastest growing and water purifying plants on earth. Until aquaponics system became ‘domesticated’ and available to the public, the problem has always been ‘how to grow ‘crops’ for human or animal consumption in wetlands without destroying the wetland itself.’ In nature, this procedure is not really possible using conventional farming techniques. The real secret to wetlands is their incredible stability as they strip out the nutrients that might easily become pollutants in bodies of water. Even floods, droughts or storms only have a transitory effect on wetlands and they recover very quickly. It is the man-made problems of diverting or removing water or filling the wetlands with soil, or polluting them that the wetlands have a very difficult time coping with and recovering. The destruction of wetlands is one of the most ecologically negative effects that expanding populations have on the earth. 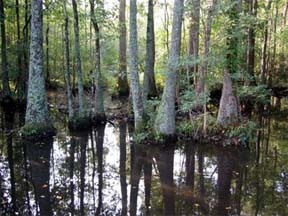 There is a growing awareness of the importance of wetlands and some countries have taken steps to protect these national treasures and repositories of diversity. The destruction of wetlands may be slowing, but the damage is still nearly incomprehensible. There are programs to recreate these high biodiversity environments, but these are very expensive and time consuming. Now using a new technology (actually an old one) brought up to date, means the wetlands can easily be duplicated inside a controlled environment, high intensity food production facility. The exact same process that natural wetlands perform, cleaning the water of nutrients, can be used to grow vegetables and herbs for human consumption. Enter the medium-based aquaponics system or the ‘wetlands in a box’ or even more correctly, a Portable Farms® Aquaponics Systems. The exact same action that has taken place in wetlands for billions of years can be duplicated in a greenhouse that can be built and operational in less than three months. Now that’s interesting, and these ‘wetlands in a box’ systems are available today. The main difference between ‘real’ wetlands and a medium-based aquaponics system is the medium (gravel) based system needs to have some help raising the crops being grown as part of the process of cleansing the water to keep the fish healthy. 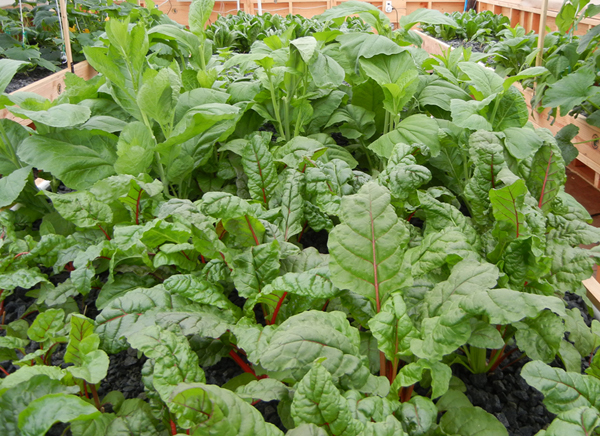 The choice of crops, surface growing greens and blooming plants, is very large and can be tailored to the local food preferences. Food Grown in a Portable Farm in only 40 days. These self-contained, modularized and standardized, backyard or commercial aquaponics wetlands require the least amount of energy and water of any controlled environment growing system in use today to filter the water to grow food. The initial investment is rather steep (because of the cost of the greenhouse), but the Return On Investment (ROI) is very reasonable, 3 to 5 years and they create an income within 45 days of becoming operational. A medium-based aquaponics system provides the bacteria and the plants a substrate to grow on. The bacteria and the plant roots are performing their magic under the surface and the beautiful vegetables and herbs are above the surface where they can be seen, harvested and enjoyed. Plus, the plants need to be harvested, replanted and regrown because they are being provided with a constant food supply nurtured by the water and nutrients from the fish and their waste, see Precision Growing.